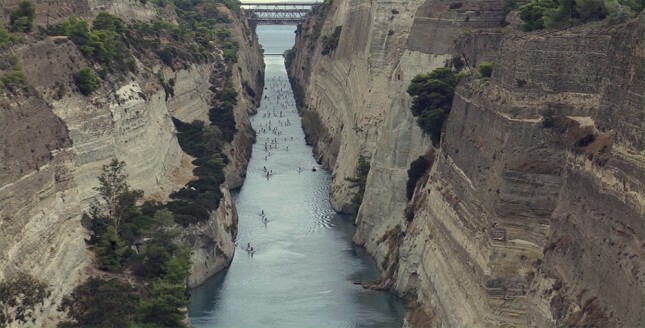 Check out this cool little clip from Greece, where the 4th Annual Isthmus Speed Crossing went down on the weekend (if you don’t understand Greek – skip to the 1:02 mark for the start of the action). The race, part of the Hellenic SUP Cup, sees competitors paddle the entire length of the Corinth Canal. 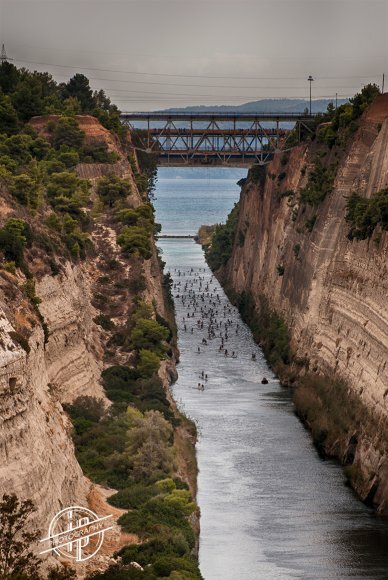 The historic canal is a long, deep cut through a peninsula connecting the south of Greece (Peloponnese) to the mainland and is famous for ushering through cruise ships that literally squeeze by with inches to spare. Stand up paddleboards are a slightly better fit though, with 147 paddlers competing on Sunday in what is essentially a 5.8km (3.6 miles) drag race. The entire course is dead straight right up until the first and only buoy turn, which comes just metres from the finish. Looks like a cool race and one that’s been on my bucket list for a while. I’m not the only foreigner who’s been eyeing it off though – I remember twelve months ago when Eric Terrien defeated Casper Steinfath in what was literally a 27 minute sprint, while this year the Speed Crossing attracted paddlers from France, the UK, Austria and Cyprus. This year’s line honours went to George Fragos, who took out the 14′ class ahead of his namesake George Konstantis and youngster Nikos Syrigos. On the women’s side, Mikaela Giasoumi was the fastest of the 14 footers, crossing the line ahead of Sofia Kasimi. Scroll down past the results for more photos or check out the full gallery on SUPS.gr.